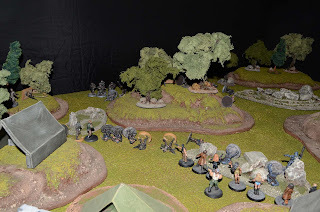 July 5th 3032 Titania "Green Zone": Earlier today a small force of Hell Knights engaged member of the Titania Militia just near Titania City in the "Green Zone". Regular vehicle traffic inside the zone is restricted to a few roadways so the mercenaries marched a force two kilometers inside the zone to reach the militia encampment. 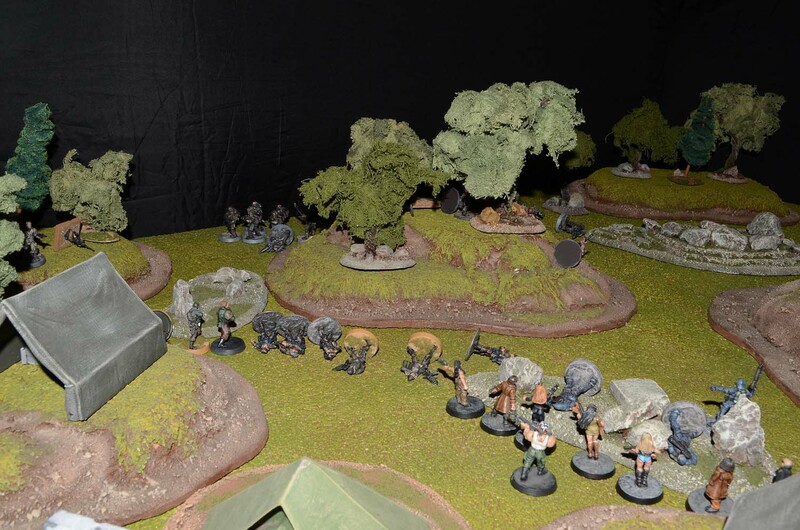 Militia members under the command of Jim Dutton had set up a hidden recruitment base and the Hell Knights intended to shut it down. 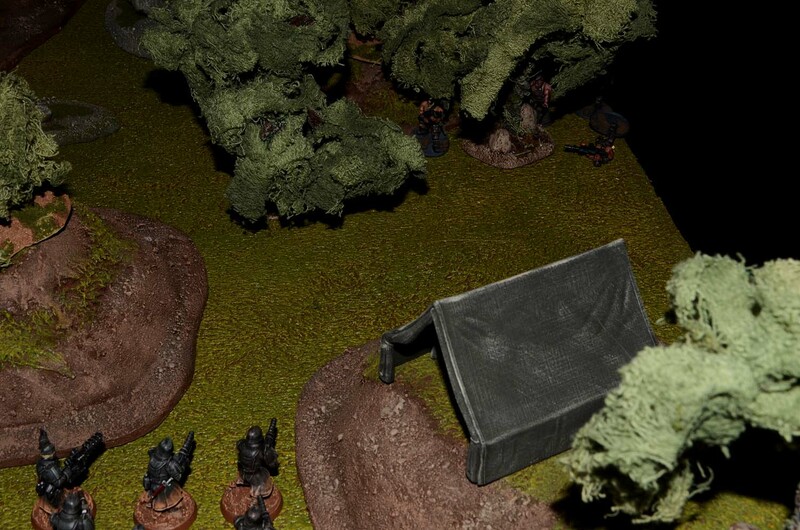 Hell Knight Scouts and Snipers crept close to the base. Two NOVA securities officers were shot down in the opening exchange. Another group of scouts on Dutton's right flank engaged some Wolfhound mercenaries but in this engagement they did not do as well loosing two of their own. The commander of the Hell Knights and two Armored Assault Squads moved in with an Assassin saying in the cover of a large hill. 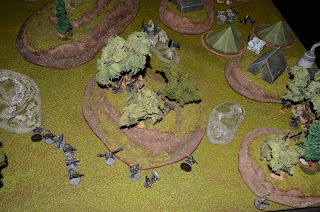 A militia sniper far on their left managed to take out one of the commanders men. 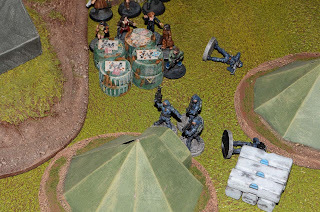 The remaining three NOVA troopers closed on the scouts and engaged them but lost another of their member in the attempt. A militia sniper kill one of the scouts but was wounded in return by a Hell Knights sniper. That sniper was killed by fire from the commanders squad members who was shot by yet another militia sniper. 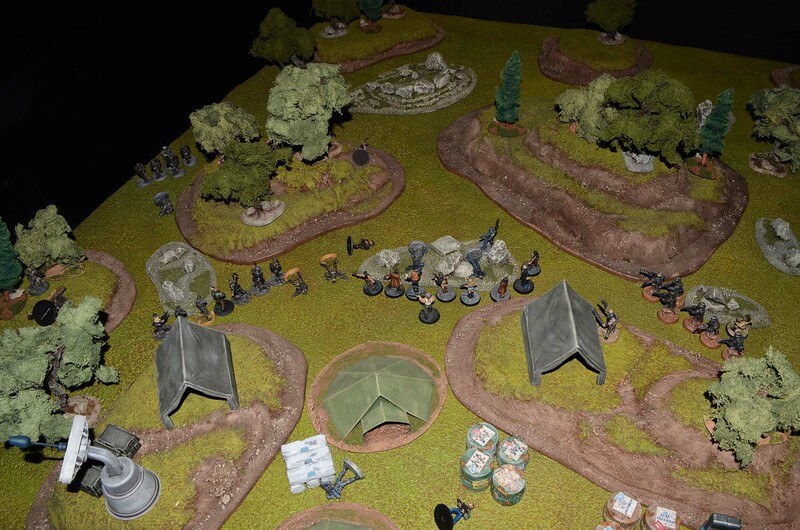 The Hell Knights commanders final squad member was killed by fire from Bear's militia unit. Another NOVA trooper was gunned down by the Scouts leaving only the Sargent. 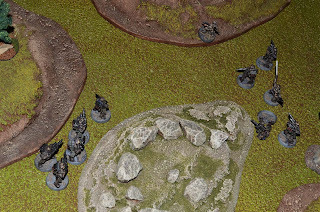 Leaping from the shadows a Hell Knights Assassin dispatched the remaining militia sniper on Dutton's left flank. The three remaining scouts on the hill killed three of Bear's militia as the other Armored Assault Squad made a steady advance. 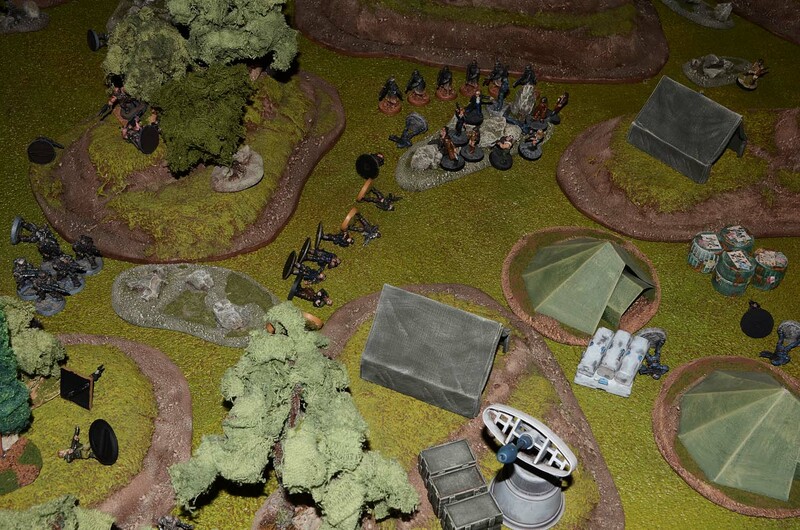 Combined fire from the Scouts and Armored Assault Squad reduced Bear's militia to two members. The return fire left only the Scout Sargent standing. 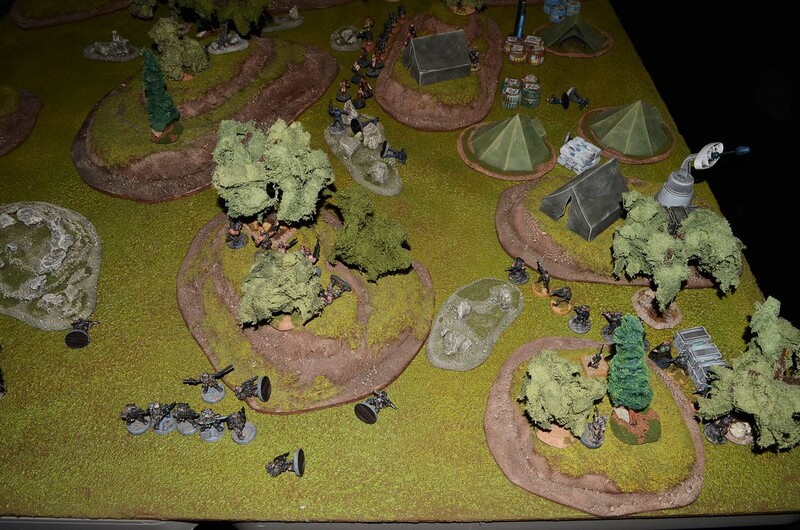 The heavily armored Hell Knights took out Bear and his last militia member as the Scout Sargent withdrew from his position. Dutton's militia and the Wolfhound mercs continued to close in. The NOVA Sargent gunned down another armored Hell Knight but the mercenaries managed to break the Wolfhounds with accurate Heavy Blaster fire. 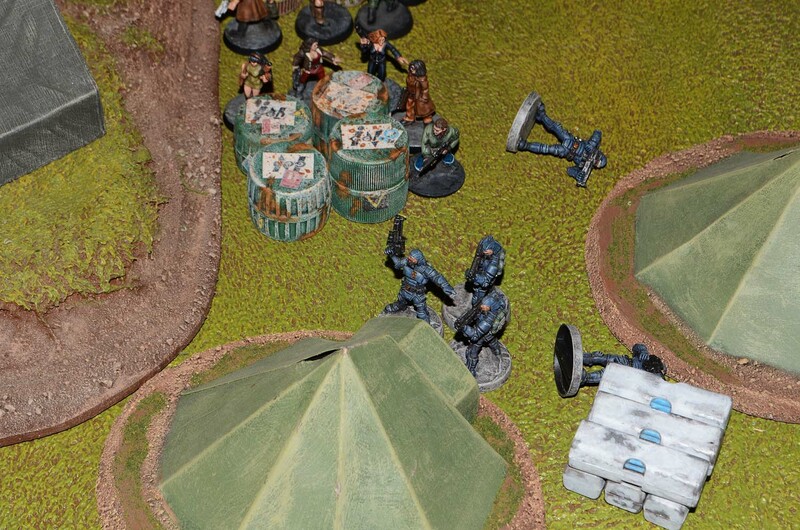 The assassin blew up a cache of militia supplies and the mercenary commander gunned down one of Dutton's men. 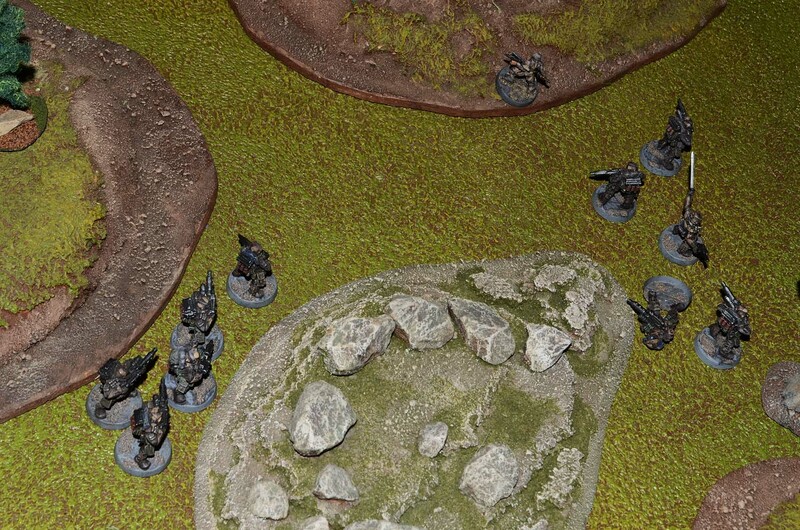 With only seven men left in the battle the Hell Knights commander chose to withdraw from the field. 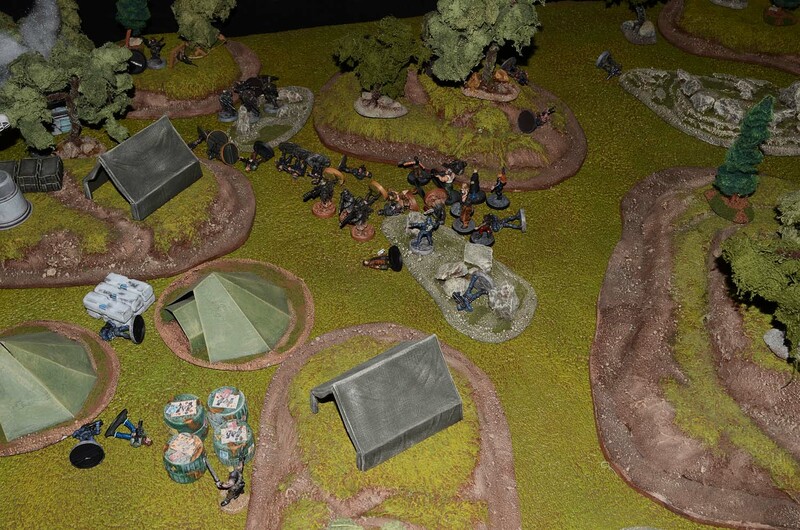 Although they had bloodied the militia they were unable to achieve their objectives. Notes: This was actually one of the more grueling battles we have had for the campaign. With no vehicles allowed there was a lot of moving but there was also a lot of moving through difficult ground and a lot of cover. The Militia snipers did a lot of damage to the Hell Knights. The Hell Knight scouts really had a great position on the hill. Elevated and with +2 cover from the woods enemy shots were at a -3 for the entire game. This made them a tough group to take out. Not only that they managed to give as well as they got in the long run. If only I had put the other scout squad in an equally good position. The Wolfhound Friekorps were also particularly nasty. 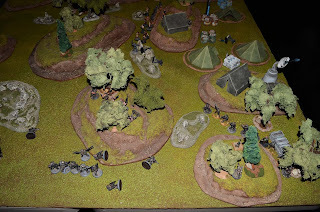 They dispatched my other unit of scouts in two turns without taking any damage. 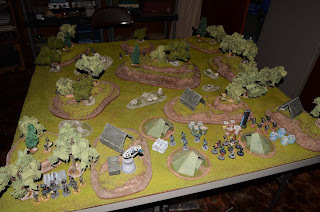 The Hell Knights objectives were to take down Dutton and Bear and to destroy supplies and the militia's generator and communications up-link. This may have been a few too many objectives especially with so many defenders to face. This ended up being a pretty solid victory for the militia although a hard fought one.